What's happening in the sky? On this cold winter night in Iceland, quite a lot. First, in the foreground, lies the largest glacier in Iceland: Vatnajokull. 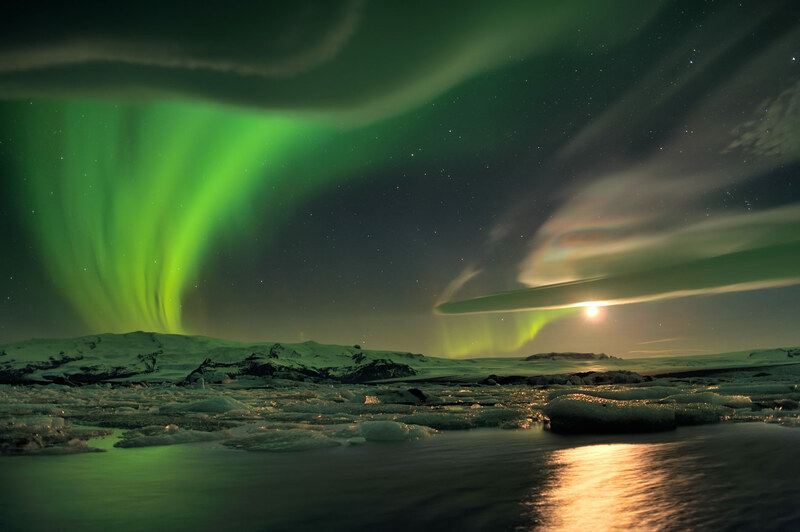 On the far left, bright green auroras appear to emanate from the glacier as if it was a volcano. Aurora ight is reflected by the foreground lake Jökulsárlón. On the far right is a long and unusual lenticular cloud tinged with green light emitted from another aurora well behind it. Just above this lenticular cloud are unusual iridescent lenticular clouds displaying a broad spectral range of colors. Far beyond the lenticular is the setting Moon, while far beyond even the Moon are setting stars. This image was captured in late March of 2012.